In recent years I’ve taken some time off from volunteering to concentrate on entomology, macro-photography and more recently bird-ringing. It’s been good to be able to go off exploring and looking for new species without feeling guilty that I really ought to be getting on with some survey or other. Collecting data is important, but life is short. 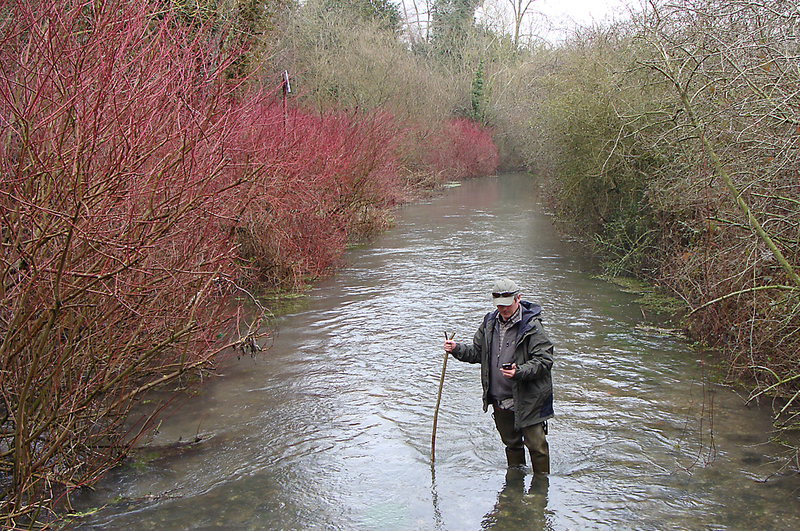 Previously, depending on the time of year I’d either be standing in a chalkstream conducting a monthly Riverfly survey on behalf of ARK (Action for the River Kennet) and the Riverfly Partnership or walking a fixed transect in a Wiltshire Wildlife Trust nature reserve counting butterflies for Butterfly Conservation or bumblebees for the Bumblebee Conservation Trust. When I get some free time to myself I like to disappear into the countryside and occasionally, if ever more rarely these days, wade into a river for bit of fly-fishing. I like the solitude, the peace and quiet. I’ve usually got a camera with me and if I spot something interesting or something I can’t identify, particularly plants or insects, I’ll take a few photos and endeavour to identify them afterwards. I love reference books of all sorts and have an almost insatiable curiosity. This blog is really my way of remembering what I’ve learnt. I started my working life at an advertising agency before setting up my own design consultancy specialising in pre-school/educational toys and games which I ran until 2005. Not only did I have the pleasure of working with some very talented people, we got to work with some great clients like the Early Learning Centre, Living and Learning and Discovery Toys in the USA. I like to think we produced some good work and we even won the odd award or two. I’m still earning a shilling or two as a freelance graphic designer/illustrator, albeit these days trying to focus on work that has some connection to nature and wildlife. I live in a small village on the edge of Salisbury Plain in south Wiltshire, England. Great blog Marc. Always nice to read the work of someone from my neck of the woods. You’re always welcome to count butterflies with us at Morgan’s Hill during the summer. We’re a Wiltshire Wildlife Reserve, fairly local to you, between Calne and Devizes. We have a butterfly transect set-up and try to survey about once a fortnight, but I admit it didn’t happen that regularly this year. Hello Nick, Thank you. I’m a big fan of the reserve. I grew up in Calne so know it fairly well. You’ll be surprised to learn that I have been monitoring the butterflies at Morgan’s Hill for the past two year’s whilst carrying out a monthly Bumblebee survey for the Bumblebee Conservation Trust. However, with Sarah Marshall leaving I’ve rather lost touch with the WWT this last year. Cracking blog dude, nice pics and word craft (?!) I sent you a link to mine which is of a very similar interest. Hello Wil, Thanks you are very kind. Just had a look at your blog and subscribed – keep up the good work. I’m sure we’ll talk again. I can’t wait for the weather to improve so I can get out and photograph some insects again. Best wishes, Marc. Is this blog still active? Cracking photography. Hi Brian, Thank you, the blog is still active, sort of, I must post something new soon.